SAN JOSE — Valley Christian High School’s running game and defense shined as the Warriors opened the season with a 21-7 victory over Campolindo on Friday. Senior running backs Javon Sturns and Trent Laubach delivered a strong one-two punch for the Warriors (1-0) as they both consistently moved the chains to sustain long, methodical drives for Valley Christian. The power running from Sturns was on display in the first drive of the game as he led the charge and got the Warriors into the red zone. Quarterback Miles Kendrick capped the drive off as he connected on a 12-yard touchdown pass to Anthony Flores for the 7-0 lead. 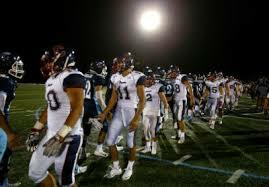 Campolindo (0-1) came up with a big turnover as it recovered a fumble inside Valley Christian territory. Senior quarterback Jacob Westphal led a nice drive that culminated in a 2-yard touchdown run from Noah Loeliger to even the score. The Valley Christian turnover was one of several mistakes Machado was displeased with throughout the game. “We allowed them to stay in the game and that’s not good” Machado said. “We let them hang around too long.” Sturns made his coach pull some hairs out late in the second half. With the Warriors leading a drive of nearly 80 yards, he fumbled at the goal line. The ball was recovered by Campolindo and the two teams went into the half tied 7-7 despite Valley Christian dominating with 230 yards compared to just 70 from Campolindo. After a touchdown run from Laubach put the Warriors back on top 13-7, the Cougars completely shifted the momentum to their side. Michael Hooper picked off a bad pass from Kendrick and almost took it to the house before getting tackled by Conner Edgar at the 2-yard line. Edgar’s tackle would prove to be huge. As quickly as the Warriors lost momentum they gained it back after a hit on Westphal at the 2-yard line knocked the ball loose and was recovered by Valley Christian. Machado said that probably the play of the game. Sturns would redeem himself in the fourth quarter with a touchdown run that essentially put the game away at 21-7 as the Valley Christian defense continued to shut down Campolindo’s offense for the remainder of the game. Despite the victory, Machado still sees areas that need improvement. “We made too many mistakes but we’ll clean that up in practice,” Machado said.